1981 to 1988 - During this time I learnt how to do traditional Fair Isle hand-knitting and hand-spinning from experienced local Fair Islanders. I hand-spun and hand-knitted a number of all-over traditional Fair Isle jumpers and hat orders for family members and visitors to Fair Isle. From 1989 to March 2011 - I was an active member and director of Fair Isle Crafts Ltd, a small, workers’ co-operative on the island, designing and producing hand-frame knitted and hand-finished garments of the recognised highest quality which were sold direct to visitors to Fair Isle from all over the world. Between 2008 and 2010 - I also produced a number of my own high quality ‘Exclusively Fair Isle’ hand-knitted hats, scarves, jumpers and wrist-warmers, made using a variety of commercial and hand-spun wool from locally grown Fair Isle and Shetland fleeces, including those from hand-shorn sheep on my own croft. 2011 - A small number of my 'Exclusively Fair Isle' hand-knitted garments were available as stock and these were sold on Fair Isle to visiting tourists during the 2011 season. 2012 - New 'Exclusively Fair Isle' knitwear in stock. A number of my hand-knitted chunky Fair Isle beanie hats in natural colours were on sale again by popular request to visitors on Fair Isle during the 2012 season. These were complimented by a beautiful collection of my own high quality hand-frame knitted and hand-finished 2 ply hats and accessories in traditional Fair Isle and natural colours which were also available for sale at Schoolton and via the Fair Isle Bird Observatory shop. On cruise ship days these were also for sale at the Fair Isle Community Hall. A small quantity of items were also available to order here on-line. From 2013 onwards - I began focussing production on my popular 'Exclusively Fair Isle' hand-frame knitted and hand-finished 2 ply hats and accessories for visitors to Fair Isle and the beginning of a small number of mail-orders items. 2014 - Following two more successful seasons on Fair Isle during 2012 and 2013 and a welcome flow of on-line orders from here on my website, I am now concentrating on the production of 'Exclusively Fair Isle' stock items ready for visitors to Fair Isle during 2014, including my very popular Fair Isle Fisherman's keps and matching Fair Isle wrist warmers. My 'Exclusively Fair Isle' bordered scarves now include a choice of a twist fringe or standard fringe. Update - 26th June, 2014 With fewer cruise ships visiting Fair Isle this season than expected, I still have a good range of stock items available for other visitors to the Isle. These items are available to customers visiting my home and the various Craft Fairs held on the island during the summer months. I am continuing to accept on-line orders here on my website as usual. Other activities - As well as planning some new designs and colour swatches for later on this season and into next year, I have also been busy assisting the Fair Isle community with an update and re-launch of the Fair Isle Marine Environment & Tourism Initiative (FIMETI) website - which is well worth a visit if you would like to find out more about Fair Isle, the island, community and culture, etc. 2015 - A total of 14 cruise ships visited Fair Isle this season, beginning in late May with a smaller number booked to visit during June, July, late September and beginning of October. This is in addition to a good number of visitors booked to stay on the Isle during the course of the season. Craft Fairs will be available at the Fair Isle Community Hall on Cruise ship days with my knitwear also available for sale and to order at Schoolton and the Fair Isle Bird Observatory shop while stocks last. A rush of early Christmas orders received from mid to late October, 2015. Order book then closed to new orders until later on in the New Year. In early October 2015, I set up a new 'Exclusively Fair Isle' knitwear Facebook page with links through to this website for those interested in my knitwear. The screening of BBC2's 'Grand Tour of the the Scottish Isles' series in mid-October, with presenter Paul Murton wearing one of my Fair Isle Fisherman's keps (see below), provided a welcome boost to my on-line Christmas orders. All Christmas orders knitted and posted on time by mid November. Order Book and Waiting List are now closed from mid December 2015 until February, 2016. This is to allow for some essential stock knitting for the forthcoming 2016 visitor season on Fair Isle, and also to enjoy my Christmas and New Year holiday with friends and family. 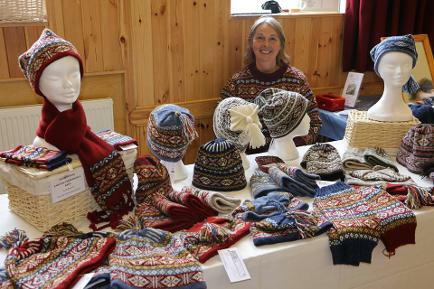 Photo: Elizabeth Riddiford with her display of 'Exclusively Fair Isle' hats and accessories at the Fair Isle Community Hall during a Cruise Ship visit to Fair Isle in 2015. Copyright Tommy H. Hyndmann.